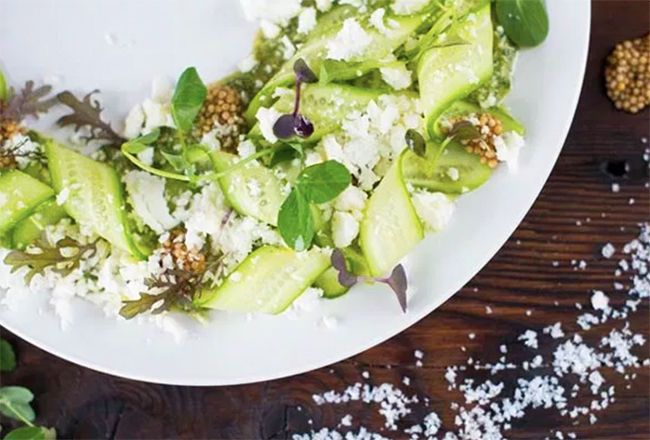 This salad recipe comes from Chef Bonnie Friesen for Taves Family Farms in Abbotsford, and includes a number of seasonal ingredients available at the markets right now! Find baby cukes from Taves, a.k.a The Applebarn, walnuts from Klippers Organics, arugula from Crisp Organics, Cropthorne Farm or Earth Apple Organics, and feta cheese from Golden Ears Cheesecrafters. Find these vendors and products using our Product/Vendor Search Tool. Combine all ingredients except the olive oil in a blender. With the blender on medium speed,stream in 1/4 cup olive oil until smooth. Add remaining 2 tbsp if necessary. On a large serving platter, place 1/4 cup of pesto on one end, and swipe down the platter.Arrange shaved cucumbers on top of the pesto. Season with salt and pepper. Crumble feta cheese over the cucumber, and top with micro greens. Drizzle the whole salad with olive oil, and serve.